Civil litigation, mediation and arbitration. The most common cases Hector handles are car accidents, workers' compensation, slip and falls and dog bites. Hector also enjoys serving as a mediator or arbitrator in similar cases. Hector is a trial lawyer who represents clients in personal injury cases. 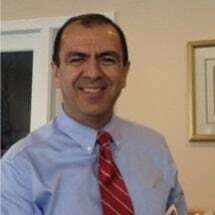 Hector is licensed to practice law in state and federal court in N.H., M.A. and M.E. He is also licensed to practice in the State of Florida. Hector has a Bachelors degree from the University of New Hampshire. He earned his Masters in Business Administration from Suffolk University. He received his Law degree from New England School of Law, in Boston Massachusetts. Hector has served as moderator for the school district in the Town of Hampton Falls, New Hampshire. Hector lives on the New Hampshire seacoast with his wife, two sons and their dog Max. He enjoys playing the guitar and piano. When he is not at work, Hector and his wife stay quite busy involved in the school and sporting activities of their children.